I love working with Matney. She is a fantastic teacher and human being. I came to her as a complete novice and I've learned so much over the last 8 months or so (so far). From catching, grooming, and tacking up to groundwork, riding, and even a little soccer. Her calm and supportive presence really aids in the learning process. If I'm having a hard time figuring out the right ask for the horse, she stays calm and gently coaches me until I ask clearly and the horse understands. When there's an issue for me she points out small things I don't even notice I'm doing, I'll modify them, and then suddenly the issue is gone. When I get flustered because of all the things I have to remember to do, she calls my attention back to my breath and it helps me focus and be successful. I also love that she puts a lot of focus on the relationship between horse and rider. As a non horse owner, I've been working with her horse, Mike (who is just the best). I feel like we've been able to get to know each other from all the time we've spent together during grooming and ground work so that by the time I started riding him, I had a solid foundation from which to start. He got to learn how I ask and I got to learn how he listens and we both modify a bit to fit each other's style. I've really enjoyed becoming friends with Matney (and Mike!) through our work together. Lessons with Matney are definitely the highlight of my week! 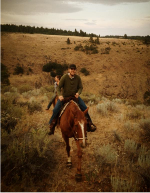 Our staff at Ekone Ranch has had the pleasure of working with Matney for both horse and staff training. She brought a wealth of knowledge and heart to our 30-year-old horse camp program with 24 horses and a dozen staff, making big deposits in the “confidence buckets” of humans and horses! Matney’s insights built on our years of experience in a way that was graceful, respectful, and effective. Her infusion of empathy and understanding has impacted every part of our camp program, from the way that we work with our horses, to development of our training and coaching staff, to the ways that we teach children how to ride. 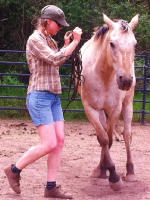 On the never-ending journey of learning that is horsemanship, Matney is a most wonderful resource and fellow traveler. Working with Matney has given me insights into the sacred relationship between horse and human. I feel myself coming into a depth relationship with the horses just by stepping into the barn. By helping me discover my own place of being inside myself and how I am with different horses, I am now able to see how that effects the horse's trust and my own leadership. It is with a sense of gratitude for the deep healing I have received from and with working with Matney that I would suggest experiencing with her intuitive way of being. Whether it is your self or your horse that needs to understand how to communicate from a place of authenticitiy instead of willful push, you will both benefit. I have gained so much from my lessons with Matney, and it started with the very first moment of the very first session. She started with comprehensive dialogue around expectations and goals for our work together, and has certainly delivered since then. Before working with Matney, I had very few experiences with horses. She has guided me through the basics while providing me with a grander view of her approach and the values within it. Coupling technical skills with emotional intelligence, Matney has provided me with foundational knowledge in horsemanship that not only creates a mutually beneficial/trusting relationship between myself and the horse I'm interacting with, but speaks to important life lessons as well. Matney's empathy resonates during each session in a way that is both impressive and magical. I wholeheartedly recommend Matney for horse lessons with zero hesitations. You won't be disappointed! Matney is a brilliant, experienced and deeply passionate horsewoman. She has an assertive softness that is at once commanding, compassionate, and cooperative. Her approach empowers both horse and rider, inviting us to discover a deeper union as partners in and out of the arena. 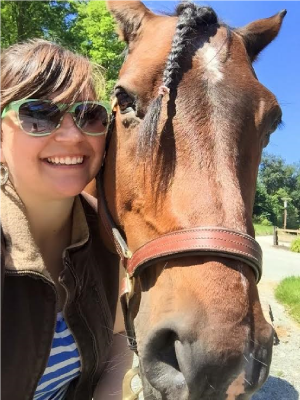 Matney has a deep compassion for horses (and humans) who have a history of rough or questionable training methods, and she patiently works to unravel and heal those old wounds, bringing the partnership into balance and mutual trust. 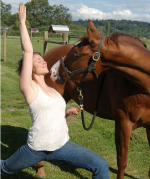 I am so fortunate to work with this talented horsewoman, from partnering with Matney for Horseback Yoga workshops to one-on-one sessions with her sweet herd, delving deeper into the possibility of healing and communication. Matney has been working with my Icelandic Mares and myself for about 4 years now. She has helped me turn my emotional basket case mare Stulka into a fun and willing partner. Stulka used to freak out if one of her pasture mates was more than a few feet from her. Matney has reinforced skills I have learned at clinics over the past few years and has used her intuitiveness to help us. She has really helped my mare Lilja recover from a injury from a fall. With a lot of patience, kindness, ingenuity and firmness when necessary, Matney has taken Lilja from a horse who would pin her ears when a rider's weight settled in the saddle (Because even though her injury was healed, her memory was of pain from a rider's weight.) to a mare who is having fun and loves being challanged with new experiences under saddle. Along this journey, Matney has helped me become a better rider and helped me be a more intuitive partner with my mares. 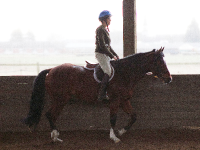 I would highly recommend Matney as a trainer for any horse and an instructor for any rider. She has a unique ability to sense just what that horse and/or rider need to further them along.